Dinosaur Alphabet Sampler - Handstamped with Stampin' Up! Here is my latest design which I've made to look like a sampler back from my cross stitching days! I've stamped it on the thick whisper white card, which was released in the new annual catalogue. I cut it to 8x10" because I have a frame that size so I'm intending to pop it in there. I used the now retired "Sophisticated Serifs" alphabet but I think this would work with the "Layered Letters" or "Epic Alphabet" stamp sets. The other stamps are from the "No Bones About it" set which I'm sure you know is one of my favourites. 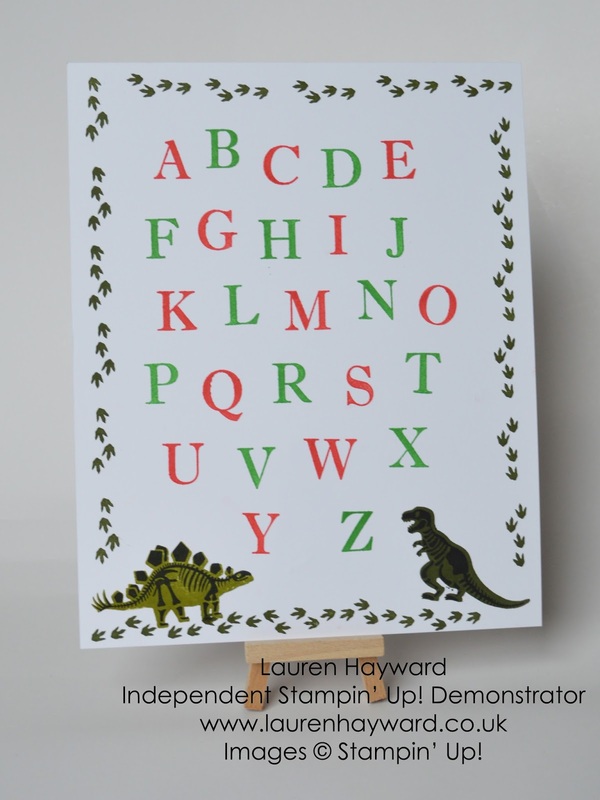 The colours used on the alphabet are Cucumber Crush & Watermelon Wonder from the new in-colour collection and the Dinosaurs are stamped in Mossy Meadow and Old Olive. I decided to go freestyle on the placing of the letters, rather than try and probably fail to get it lined up. I think it works well. Let me know your thoughts.